The wild orca found in the Wadden Sea in 2010 and now kept at the Loro Parque amusement park in Tenerife is pregnant, in contravention of the conditions of her transfer to Spain. The orca, nicknamed Morgan, was found in a severely weakened state in the Wadden Sea in 2010 and sent to the Dolphinarium in Harderwijk to recover. The then-junior economic affairs minister Henk Bleker, who was responsible for Morgan, decided she could not be returned to the wild and she was sent to the Loro Parque in Spain instead. The original European CITES certificate approving the transfer stated that Morgan would be used for research purposes only. 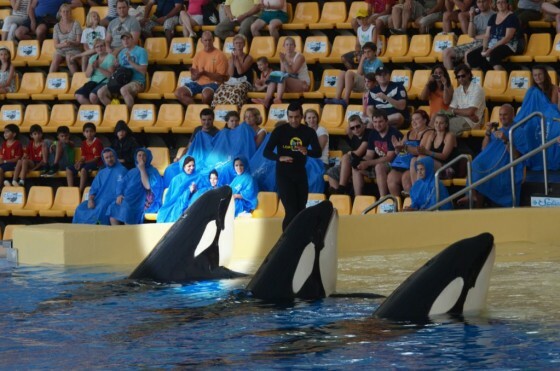 However, the orca has since become part of a show of performing animals and, according to the Free Morgan Foundation (FMF), which is fighting to release the animal back into the wild, her health is suffering. Breeding the killer whale would also be in breach of the certificate. ‘For us this news doesn’t come as a surprise. Loro Parque has been busy for years trying to get Morgan pregnant. They have done this despite the ban on breeding and her young age when a pregnancy can be dangerous to both mother and calf,’ FMF vice chair Hester Bartels said in a statement to the press. Morgan is now 11 years old, with an expected average life span of 50. The news about Morgan’s pregnancy comes only weeks before a court hearing on January 23 in which the decision by the junior minister not to intervene regarding Morgan’s situation at Loro Parque goes to appeal. The foundation says new evidence has emerged concerning Morgan’s welfare at Loro Parque, including the failure of the Dutch and Spanish CITES management authorities to abide by the terms of Morgan’s exemption certificate. They also failed to take affirmative measures to ensure that Morgan is not subjected to breeding, the foundation said. Morgan’s pregnancy will result in a hybrid calf. While this would do nothing for the maintenance of the wild orca population, a calf with a new bloodline would be financially advantageous for the park, the FMF said. The park, however, says breeding programmes are in line with the European guideline and the Spanish law on zoos.